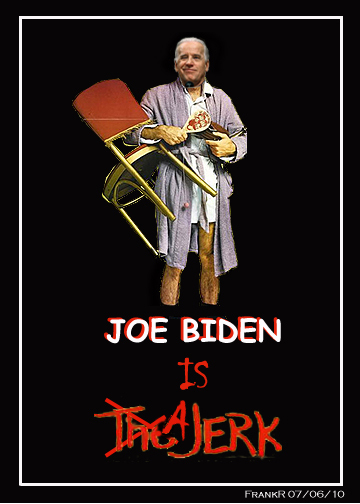 Former Vice President "Slow Joe" Biden announced his candidacy for the Democratic nomination for Vice President today. Reporters and fellow Democrats were taken aback by this surprising announcement. Slow Joe stated that there were several reasons for his decision to run for Vice President rather than President. First, he listed the 8 years of experience that he had as VP under Obama which made him more qualified than anyone else for the position. He stated that it was really like a highly paid part time job with the only downside being considered a lowly step-n-fetch-it. Second, he acknowledged that he was a "gaffe" machine which could cause problems if elected to President. If President, a simple "stand up Chuck" type gaffe could cause an international incident or start a war. Third, as Vice President. he would serve as protection for the President as no one would assassinate the President to allow him to become President. Fourth, as a moderately senile and mentally diminished senior, no candidate for President would consider him to be a threat from the inside. Lastly, I need a job badly. If I don't get the VP job it will be four more years of changing the cats litter, vacuuming, doing laundry and listening to the wife b!tch about how Obama and Hillary did me wrong. And considering his groping and fondling he’s experienced in vice.